The tritone substitution is one of the most common substitution found in jazz. The basic application of a tritone chord substitution is to take any 7th chord and play another 7th chord that has its root a tritone away from the original. This guitar lesson demonstrates how you can play scales and arpeggios starting from the b5 (a tritone away) of the V7 chord in a II V I chord progression. This way you will highlight altered tones as the b9 and the #11. How To Use a Tritone Substitution Over a II V I Progression? How to Solo Over Tritone Substitution? The root of Db7 highlights the #11/b5 of G7. The third (F) of Db7 is the b7 of G7. The fifth (Ab) of Db7 highlights the b9 of G7. The minor seventh (B) of Db7 is the third of G7. The second option is to play a dominant 9 arpeggio (1 - 3 - 5 - b7 - 9) which means that you have to add the ninth to the previous dom7 arpeggio. The ninth (or second) of Db7 (Eb) highlights the b13 of G.
The third option consists in playing a major pentatonic scale (1 - 2 - 3 - 5 - 6). The second of Db7 (Eb) highlights the b13 of G.
The third (F) of Db7 is the same note as the b7 of G7. The fifth (Ab) of Db7 is the b9 of G7. 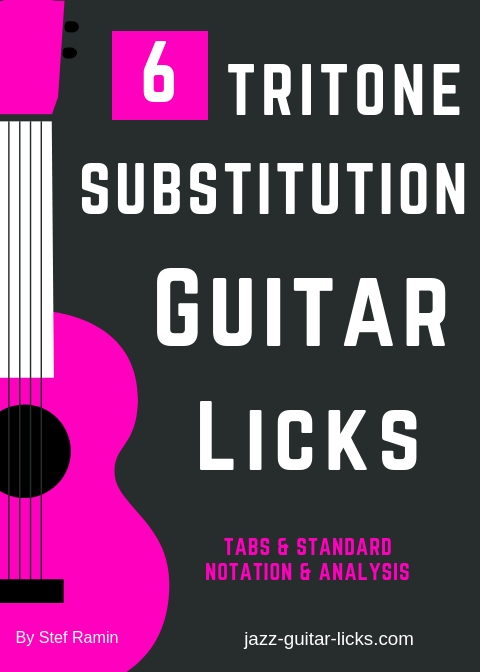 The fourth option to solo with a tritone sub is to use the Mixolydian mode (1 - 2 - 3 - 4 - 5 - 6 - b7). It has the same note as the major pentatonic scale with a fourth (4/11) and a seventh (7). The fourth of Db7 (Gb) must be treated as an approach note. The seventh of Db7 (B) is the third of G7. You will find below 6 easy jazz guitar lines using the four previous scales to approach tritone substitution. You can hear these 6 licks in the YouTube video at the top of this page. You can also download the free PDF by clicking on the picture at the top too. Bar 1 : D minor pentatonic scale. (D - F -G - A - C ) C is not played. Bar 2 : Db major pentatonic scale (Db - Eb - F - Ab - Bb). Bb is not played. Db is the #11 of the G7 chord. Eb is the b13 of G7. F is the minor 7th of G7. Ab is the b9 of G7 . Bar 3 : C major pentatonic scale (C - D - E - G - A). A is not played. Cb is the major third of G7. Measure 1 : Dorian mode (D - E - F - G - A - B) B is not played. Measure 3 : Ending on the root of CM7. Measure 2 : Db9 arpeggio (Eb - Cb - Ab - F - Db) and chromaticism to approach the root of CM7. Measure 3 : Ending with two chords CM7 and C6/9. Measure 1 : D Dorian bebop (D - E - F - F# - G - A - B - C). The Dorian bebop scale is the Dorian mode with a passing tone. Measure 2 : Db7 mixolydian mode ( Db - Eb - F - Gb - Ab - Bb - Cb). Measure 3 : C major arpeggio (C-E-G) and C major scale ending on a C69 arpeggio (C-A-D-G). This lesson provides a YouTube video link to 10 dominant jazz guitar octave lines with tabs and notation for guitarist. This lesson provides guitar diagrams, harmonic charts and exercises with tabs to learn how to comp using open and close triad chords. Tetrad chords are most known as seventh chords. They regroup seven types of seventh chords. This lesson explains how to make the difference between them and how to play drop 2, drop 3 and drop 2-4 tetrad voicings on guitar through 48 diagrams. This lesson provides charts with formulas about the main scales and modes used in music.